Left: Soil continues to erode down to the chert layer at the former logging site in Polk County, Tenn. called the "Island Creek/Hogback sale" atop Sylco Ridge south of Parksville Lake. 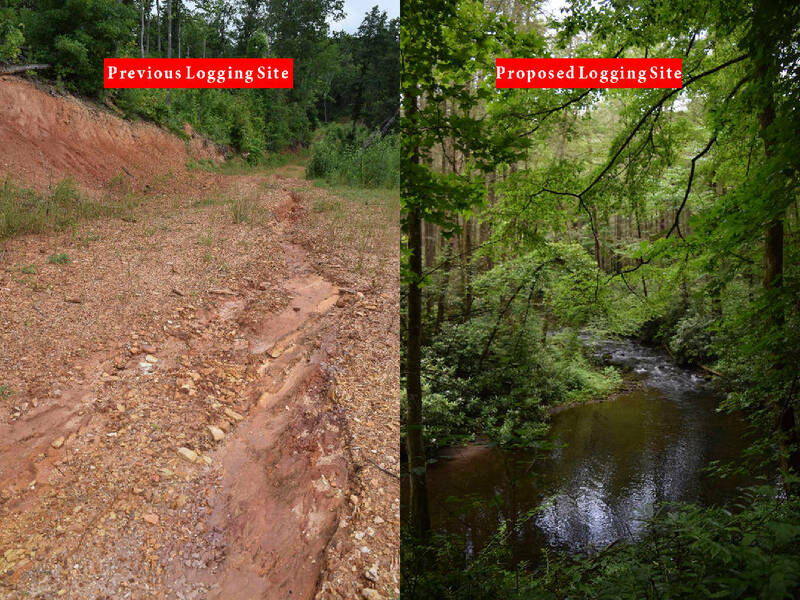 Right: Local conservationists are worried erosion from a proposed logging project, the "Dinkey sale," along Tumbling Creek, a trout stream in the mountains west of Copperhill, Tenn., could cause significant damage to the environment. Tennessee Heartwood, a nonprofit group that advocates for Tennessee’s public forests, describes the current work proposed for the “Dinkey Sale” located in Polk County, Tenn., near the Georgia border. • 75-acre “extended stream side management zones” for logging of 50 percent of the canopy along Tumbling Creek. This will be the second-tier buffer strip between the creek and the heavy logging along the slope. • An old logging road will be reactivated across Tumbling Creek at one point, where a deposit of Anakeesta Shale is located. Anakeesta Shale is known to cause acid rock damage where roads have been cut in the past. • Some of the slopes that will be logged exceed 35 percent in steepness and are highly susceptible to runoff, erosion and compacting from logging equipment. COPPERHILL, Tenn. — A proposed logging project in the Cherokee National Forest in Polk County, Tenn., has conservationists worried for the upper waters of a sparkling trout stream that winds through hemlocks and beech trees. The project includes "a mixture of clearcuts, seedtree cuts [clearing most growth to leave just five to six trees per acre], shelterwood cuts [leaves a bit more], and thinning. These are some steep slopes on sensitive soils," according to a statement from Tennessee Heartwood, a nonprofit group that addresses issues in the Cherokee National Forest and other public lands across Tennessee. Officials said the Forest Service's timbering work combines efforts to remove species not characteristic to the area — such as stands of white pine — and replace them with characteristic species. Removed trees can be a commercial benefit to the community, while replacing them helps replenish original species. But that takes patience, planning and study. Chattanooga resident Davis Mounger is among those who think the U.S. Forest Service can find other timbering sites far more suitable than the steep, fragile slopes above Tumbling Creek. Other opponents believe the creek and the mountainside could suffer harm that will linger for decades — or longer. It's time for Forest Service officials to "slow down and see what's working and what's not working," said Mounger, national forest chairman for the Tennessee Chapter of the Sierra Club, co-chairman of Tennessee Heartwood and the Heartwood network, a multistate group. He cited "Island Creek/Hogback sale" timbering project on Sylco Ridge in the Cherokee National Forest several years ago as a "disaster." There, topsoil has eroded away to the chert layer, and most of the vegetation consists of plant species "like sumac, maples, poplars, blackberry, buckthorn and other scrub, with Virginia pine a lot of the time," Mounger wrote this month in an email about the site. A half-mile walk through the upper portion of the site reveals flourishing underbrush and weeds but few trees growing on what mostly appears to be the reddish shale and chert layer that once was covered by topsoil. Runoff has cut deeply into the soil along and through the logging roads that crisscross the steep slopes. More desirable species of plants and trees just are not regenerating, Mounger said. It's time for some new ideas and federal officials seem willing to listen, he said. They worried especially about possible acid rock drainage from the underlying Anakeesta shale that could be exposed during road construction, and the likely erosion of the steep slopes. Mounger and Sheryl Campbell, who wrote the letter on behalf of the three groups. urged officials to look at the Hogback site's similarities in geology and contours as an example of what to avoid to escape environmental damage. "We have been greatly concerned about the cumulative effects of the proposal on Tumbling Creek, and any significant change that will likely lessen the impacts of logging along the Tumbling Creek corridor is encouraged," Campbell and Mounger wrote. In an email to the Times Free Press, Mounger said the Forest Service recently released a preliminary decision on the sale. "Those who have legal standing to object, such as our organizations, have 45 days to do so. We plan to formally object and hope that they will withdraw or at least scale back considerably this project," he wrote. "We are concerned that what happened at Hogback will also happen at Dinkey," Mounger wrote. "To its credit, the agency has added some mitigation measures that were not in the original proposal, but we nonetheless find them inadequate. Indeed, we feel strongly that the supposed benefit to logging along the Tumbling Creek watershed is far outweighed by the risks that have clear precedent." Mounger said restoration of some species is unnecessary because they are already represented in the area and there are "already a number of degraded lands in this watershed where shortleaf [pine] would more likely take hold than a shaded, steep slope that currently includes hemlock and beeches." Forest Service officials didn't respond to a request for comment. Sam Evans, national parks and forests program leader for the Southern Environmental Law Center in Asheville, N.C., said the Forest Service is changing and groups like the Sierra Club, Tennessee Heartwood and Heartwood are in position to join in a new age of public lands management. The center is not involved in the conservation groups' official objection. Evans said the Forest Service is evolving from a crop management approach to one of making the best use of the public lands it manages. Conservationists and the Forest Service are closer than ever to becoming teammates. Evans and Mounger both said they believe Wright, the district ranger who has come to the post in the last few years, is an example of a new era for the federal agency. On a joint field trip to the area with forestry officials, Evans said federal officials and group representatives basically agreed there was an ecological justification for logging white pine trees from some areas but disagreed on the potential for damage where there are steep slopes. Forestry officials have a strong desire to get rid of the white pine so native species can return. "Logging isn't just for the purposes of crop production," Evans said. "We're going to use logging where it's appropriate as a tool to fix the mistakes of the past and, if we can, get some commercial uses out of it, too." He said conservationists must have a level of trust in professional foresters who actually manage the work. "We understand that the Cherokee National Forest is trying to learn a lesson and avoid those mistakes in the future, and we're willing to give them the benefit of the doubt that when they implement this project that they'll give full sensitivity to the risks because they know people are watching," Evans said.